Tonight I made pad thai for the first time. My dinner and subsequent post were delayed by having to attend a long and boring condo board meeting. However, the pad thai actually didn't take long to make and turn out great. 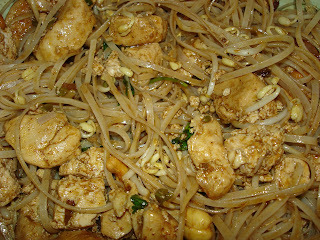 Tonight's pad thai recipe has plenty of wonderful flavors. I also think that I have worked out a wonderful vegetarian variation to this dish as well, which I plan on making for an upcoming dinner party we are having in January with some vegetarian friends. Thai food is one of my favorite ethnic cuisines. Thailand is one part of the world that I would love to travel to (the closest I've been was a trip to Australia and New Zealand in 2004). My mother spent three weeks in Thailand a couple years ago and I would love to go back with her on a mother daughter trip in the next couple years. She loved visiting the elephant preserve, as well as the different types of thai dishes she ate in Thailand, which has encouraged me to experiment with some different Thai dishes, including pad thai. 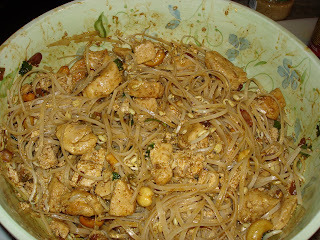 Here is the recipe for Pad Thai. Note that I included a vegetarian/vegan variation on the recipe that I made tonight. Season and grill the tofu and/or chicken separately until cooked through for the chicken or slightly charred for the tofu. Set aside. Heat 2 T of truffle olive oil in a medium saucepan. Note that truffle oil, if you have it, might work as well. However, I have never had the privilege of cooking with truffle oil, as it is extremely expensive. A smallish bottle of truffle olive oil, which I did use, will cost you about $10. Add the shallots and garlic and cook until soft. The add the ancho chile powder, tamarind water, vinegar, peanut butter, fish sauce, brown sugar and peanut butter. Bring to a boil. When the sauce has a nice not-too-thin but not gooey consistency, you can turn the heat off. If it gets a little too gooey, add a bit of extra water to thin. Add the sauce to a large bowl with the chicken and/or tofu. Add the pad thai noodles and sesame seeds and mix. As I said above, do not be afraid to make a vegan/vegetarian version of this dish. 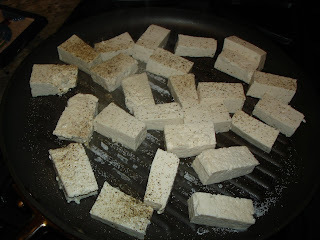 I love tofu even though I am not a vegetarian. I find it extremely rewarding to cook with since it basically adapts the flavors of the other ingredients that are used in whatever sauce it is cooked with. Preparing this dish with tofu, along, rather than combining with chicken, would help highlight the other flavors in the dish - namely the truffles, tamarind, and peanut butter. I think that some sauteed pineapple would also potentially be a welcome addition to this pad thai, which I might consider adding in the future. Mm...I might have to make pad thai soon.